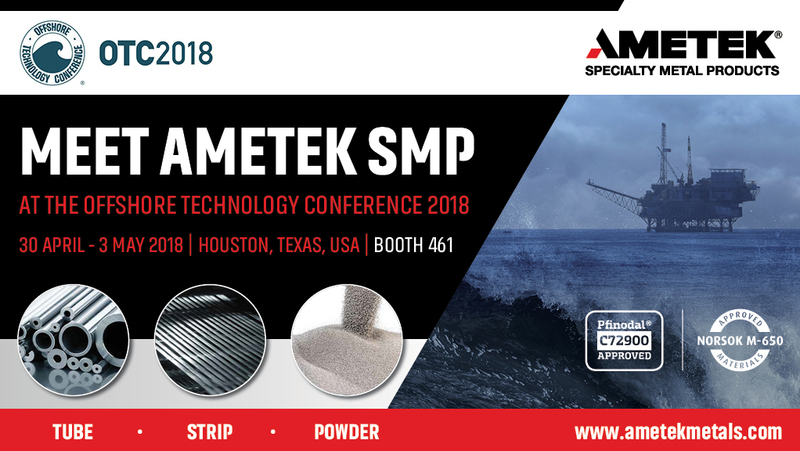 AMETEK Specialty Metal Product (SMP) will be exhibiting on Booth 461 at the Offshore Technology Conference (OTC) which is being held from 30th April to 3rd May at NRG Park in Houston, Texas. Showcasing the leading-edge technologies for offshore drilling, exploration, production, and environmental protection, OTC is the world's foremost event for the development of offshore resources. This will be the 50th edition of OTC and is set to attract over 70,000 industry professionals. With increasing market activity and rig count, OTC offers an excellent platform for AMETEK SMP to present its high-quality products for critical oil and gas applications that demand maximum strength, pressure, temperature and corrosion resistance. The AMETEK SMP businesses that will be exhibiting at OTC include Superior Tube, Fine Tubes, AMETEK SMP Eighty Four and AMETEK SMP Wallingford.